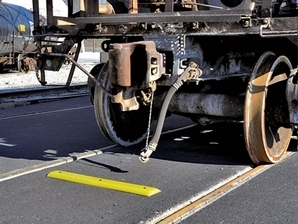 Low-profile bright yellow urethane marker to indicate parking limits on tracks encased in concrete or asphalt. Marker is 36" long by 6" wide and 1" thick. All four sides of the marker are beveled to avoid being caught by snow plows. Keep the marker visible in winter by sweeping it clear of snow when you clean the switch points. Marker is installed perpendicular to rails at the same distance as required for exposed track clearance markers. In concrete paving, marker is anchored with three lag bolts and expanding shields. "Getting Close" Indicator: Install Track Clearance Markers one car length away from Bumping Post to alert switch crew to prepare to stop.